We stipulated: Flying home from SXSW, I wanted one last dose of BBQ before boarding. 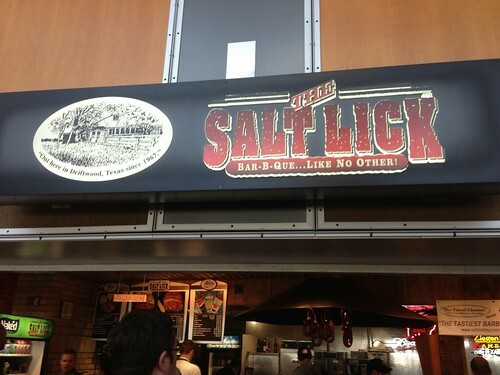 It was lunch time, and The Salt Lick has a location right inside the Austin airport! They stipulated: "The barbeque sauce has no tomatoes so it won’t burn or become bitter. It does have sugar so it will easily caramelize. We sear the meat and then move it away from the hottest part of the fire to cook slowly. We finish our products over an open fire fed by live oak wood." High point: Just the existence of The Salt Lick at the Austin airport means it boasts some of the best food options of any airport anywhere. Nice size, nice price. Low point: But I did feel a bit ripped off in buying a bottle of their famed BBQ sauce to bring home. It cost a lot more than the $10 you can buy it for online. Overall impression: It's no substitute for visiting the original location, or any of the Austin BBQ restaurants. But if you're eager for one last meal before departing Austin, you gotta hit the Salt Lick. Bonus: the entire terminal smells like BBQ. Will we return: Next time I fly home from Austin. 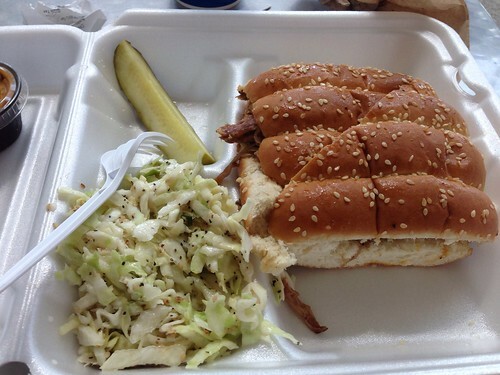 this is my all time favorite bbq, either at the airport or at the original way outside of austin. the chopped brisket will make you cry with joy.